Original watercolor on paper by Adrian Sauers. 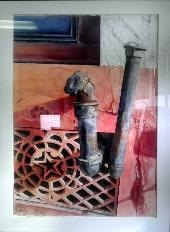 Image size 29 1/2 x 42 inches. 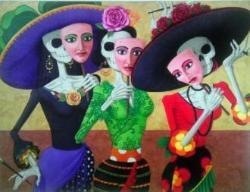 "Ladies Put Your Faces On" by Eric Sheaffer. Original acrylic on canvas. Image 35 1/2 x 48 inches. 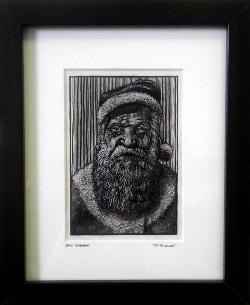 Original scratchboard Santa by Dirk Shearer. Image 3 1/4 x 5 inches. 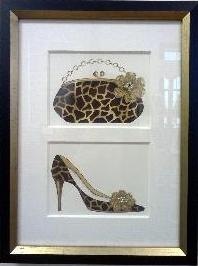 Swanky purse and shoe collage by S.E. Hagarman. We also have prints! 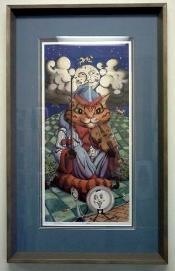 Print of Hey Diddle Diddle by Eric Sheaffer with triple mats, silver frame and conservation clear glass.